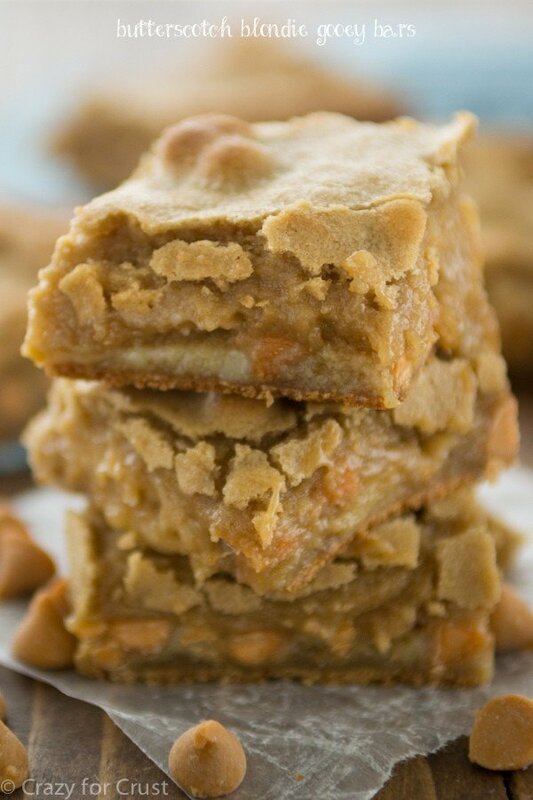 Gooey cookie dough and butterscotch lovers: these butterscotch blondie gooey bars are for you! Mel and I hardly ever go to movies anymore and when we do go, it’s during the day. But last weekend we redeemed one of our [hashtag] only child perks: Jordan had a slumber party so we got a date night. Anyway…I totally recommend the movie. Just maybe don’t drink at all during the first 2 hours and 15 minutes, mmkay? Also? I recommend these. They’re super gooey, super butterscotchy, and they’re just plain good. 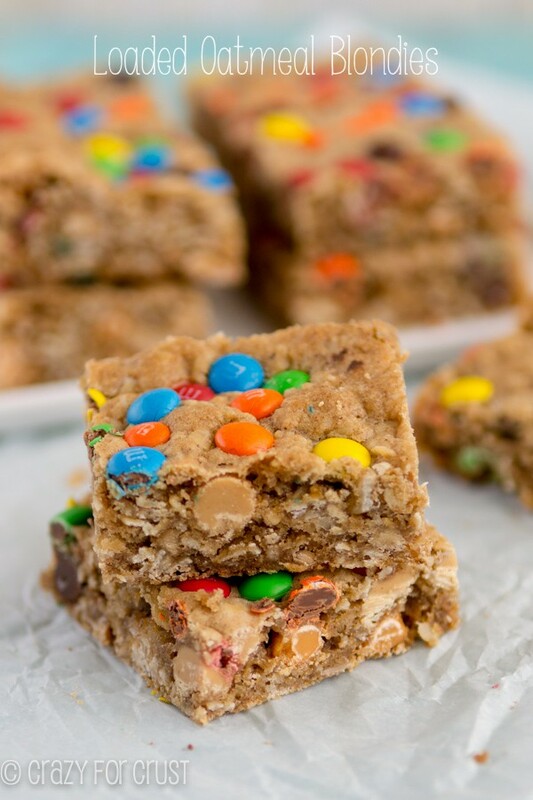 These blondies are the same base as my favorite blondie recipe. It’s my go-to recipe for all things blondie bar. As baked in a regular recipe, they’re super chewy and soft from all the brown sugar. But in these? They’re soft and gooey to the extreme! I left the batter plain – no mix-ins. It’s a purely brown sugary bar cookie, which lends itself to butterscotch even without the chips. Instead of using a 9×13″ pan, I used a 9×9″ so I could make two layers to create the gooey center. Like all my gooey bars, the center of the bar is made using a 1/2 cup of sweetened condensed milk and some chips or candy of some sort. 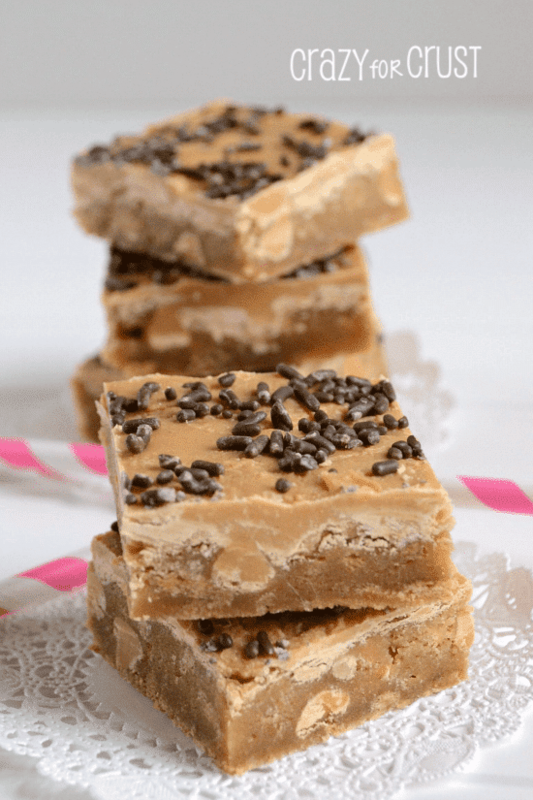 This recipe uses butterscotch chips…obviously. Simply sprinkle them on the base layer of blondie dough, pour the SCM over them, and press the rest of the blondie batter on the top. When they bake, the outside of the bars get golden and a little crunchy and the center stays suuuuuuper gooey. Like, it’s almost like eating dough. Which is what I like the best about gooey bars in the first place! Pretty much if you like gooey and you like butterscotch, you’re going to love these bars. 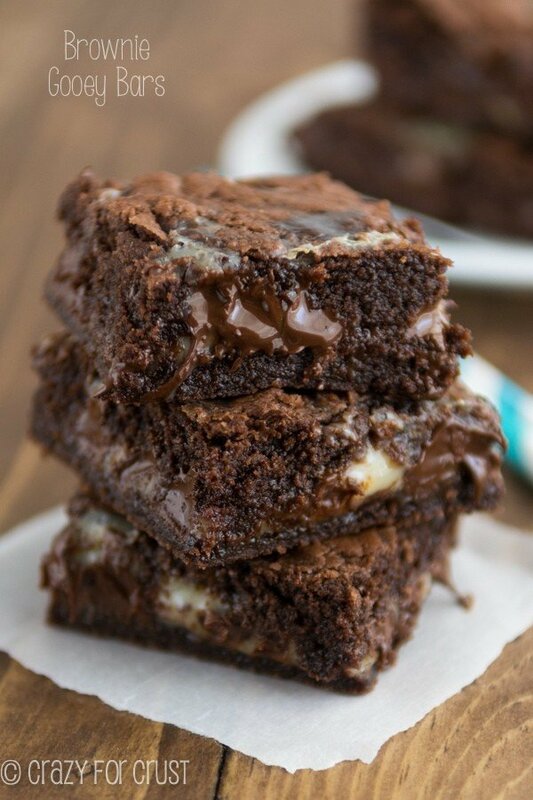 These are gooey to the extreme! 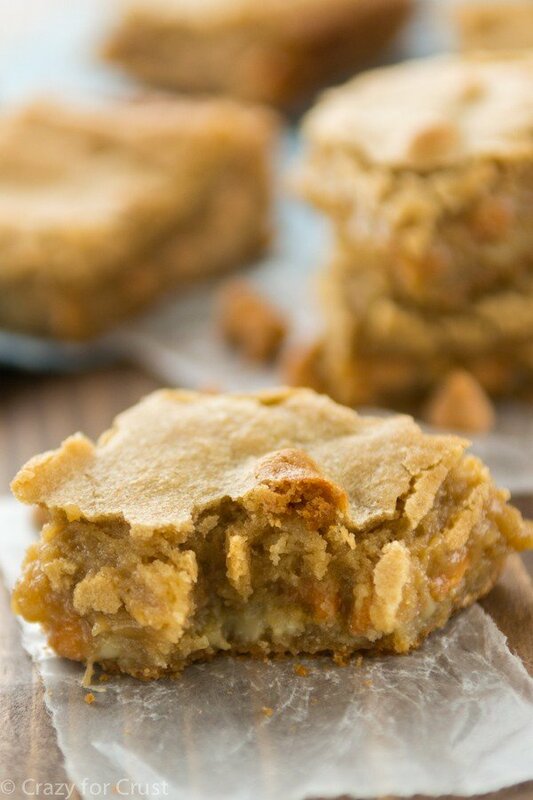 If you like eating cookie dough, these blondie gooey bars are for you. A cup of butterscotch chips takes the flavor over the top! Do you know if I reduced the sugar it would mess up the gooeyness? These are amazing and wonderfully gooey. I made these in a 8×8 which was a mistake. It rose too much and dripped over the side. So I learned my lesson. I think you could reduce it by 1/4 cup (maybe more) and it’ll be just fine! Hi, can I make this without the butterscotch chips? And lessen the sugar?